Genre: Genuine traditional pirate shanteys. Buy it now from Billy Bones’ Pirate Locker! If you want to give a try to a more traditional style of pirate music, then this is for you. 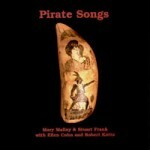 These are very traditional sounding sea-songs, all having to do with piracy. Not only are the songs authentic, but the voices that sing them also feel very real – not all studio polished and Britney Spearsish, but like real, sea-going folk. It’s fun, but generally something I can only take in small doses. One song does stand out, however – “Bold Trinity” is truly a haunting song, and sure to enrage cabin boys everywhere.